The aim of this study is to evaluate factors affecting postoperative outcomes after laparoscopic total abdominal colectomy (TAC) for ulcerative colitis (UC). Patients undergoing laparoscopic TAC for severe UC/indeterminate colitis during 1998-2010 in our institution were retrospectively identified. Demographics, disease characteristics and perioperative outcomes were recorded. Associations between short-term outcomes and patient, disease and treatment-related variables were assessed using univariable and multivariable logistic regression models. A total of 204 patients (105 males, mean age 38.5 years) were identified. Conversion rate was 4.4%. Median blood loss, operative time and hospital stay were 100 ml, 185 minutes and 4 days, respectively. 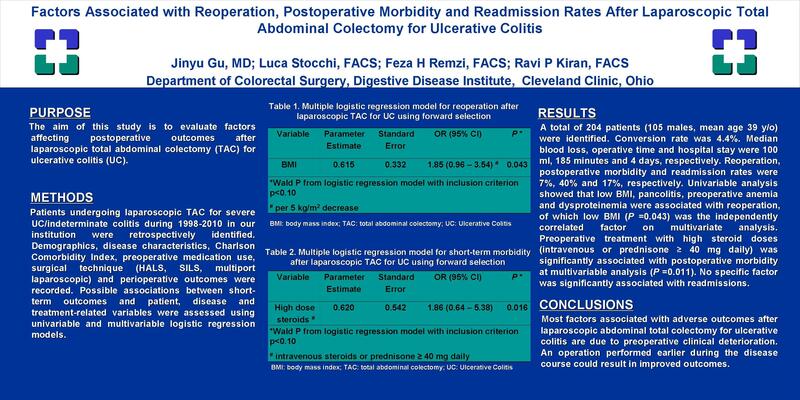 Reoperation, postoperative morbidity and readmission rates were 7%, 40% and 17%, respectively. Univariable analysis showed that BMI, pancolitis, preoperative anemia and dysproteinemia were associated with reoperation, of which low BMI (P =0.043) was independently correlated on multivariate analysis. Preoperative treatment with high steroid doses (intravenous or prednisone ≥ 40mg daily) was significantly associated with postoperative morbidity on multivariable analyses (P =0.011). No specific factor was significantly associated with readmission. Most factors associated with adverse outcomes after laparoscopic abdominal total colectomy for ulcerative colitis are due to preoperative clinical deterioration. An operation performed earlier during the disease course could result in improved outcomes.